Being a Christian so Long I Forgot I was one… Or rather, I forgot what it meant. Now I am not sure what number you had in mind when I said “so long”. It can be a year, it can be 30 years, but all you know is a passage of time has gone and somewhere you might have forgotten what it was you were doing or why you were doing it. You might not have forgotten what it is you believe what you believe but really what it means or what to do with it. I remember sitting in an Easter Sunday service years ago and balling my eyes out because for the first time I truly heard and understood the gospel. I understood what Jesus was for, why he had come, why he had to die, and why I so desperately needed him. For several Sundays after that, even though I forced matters, it became pointless to wear make up as by the end of each service my eyes would be a smudged up mess of mascara and eye-liner. It wasn’t that the preacher was animated or saying statements to purposefully stir my emotions, it was just good old bible teaching. I was struck. After years of circulating different religions and “versions” of what I thought was Christianity, I got it and thus came the life change. Where has the buzz gone? Fast forward a few years and I have served in different ministries, becoming a part of the furniture as most would call it. Me being a Christian isn’t a thing, it’s just what I am and slowly I found I stopped thinking about it. No, I have not given up on the faith or anything like that, but it’s almost a going onto auto-pilot where things are done out of habit rather than genuine desire or from a genuine heart. It is not a matter of not wanting to be there, but perhaps simply not being as mentally and emotionally present as one should be. Many Christians I have walked with warned about seasons like this. And have shared from their own experiences. Where slowly the words of scripture become dull, fellowship with the saints becomes just a Sunday ritual, bible study becomes a place to socialise and get a free dinner, and prayers are filled with words and phrases that sound good enough to sound genuine but aren’t too personal in that they reveal anything to the strangers you are praying with. But I am still a Christian aren’t I? I even know where the book of Habakkuk is without looking into the index (okay, no, that’s a lie). But I am one. I believe in Jesus as God; it might not be in the front of my mind, but yes I believe…that counts right? Maybe it does, maybe it doesn’t, I am not sure. I know feelings are temporary and how I feel doesn’t qualify my faith, Christ does. However, I can just imagine how horrible it would feel if you invited a friend out for coffee and they spent the entire time on their phone or picking their nails, but insisted you have no right to be upset because they were there and cappuccinos were had, weren’t they? But thank God for God and how he is the one who does the work in our hearts. Not allowing us to drift or let go even when we are worried or have stopped being concerned that we have. Thank God for his faithfulness and his continuing to remind us of who he is when we get distracted or allow other things to steal our affections. I sat last week at the evening service as I regularly do and was cut to the heart by Reggie Lamityi’s sermon “God is For us” based on Romans 8 (Click here to listen to it). Reading and hearing words I had heard many times before, but in this season they were so timely and very much needed. In a walk where the battle against sin leaves me weary and tired, wanting to give up, I was reminded that indeed there is no condemnation. Yes, I have heard that before, many times. It’s been the “go to” passage for many a preacher whom I have listened to over the years, but in that moment, even after years of practising this faith, I forgot that this was a truth. A truth that I, through Christ, could hold onto in my weakest moments. No condemnation – despite how unworthy and guilty I felt. I was reminded that God is sovereign. Again, another phrase we throw around loosely like it doesn’t mean that the whole world really and truly is in his hands as the old children’s song says. As though it doesn’t mean he is not surprised when we present our needs to him in prayer and that there is a purpose and plan for it all. As though it doesn’t mean we can actually rest in knowing our lives aren’t left up to fate or chance, but are up to God who created and knows all things. Finally Reggie reminded me how indeed the Holy Spirit intercedes for us. Praying prayers we cannot say, covering exposed areas we haven’t noticed, protecting, convicting, comforting us when we aren’t even aware that we need it. All these are concepts I knew; I hadn’t forgotten, but I stopped engaging with them. 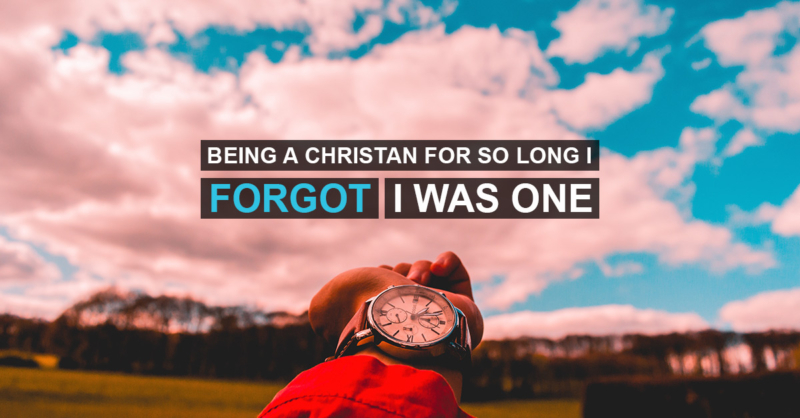 Indeed, I had been a Christian for so long I forgot I was one. So often with many things in life, we forget to keep the fire alive; it goes out and we wonder why things look so gloomy and feel dead and cold. The enemy thrives in our passivity and lack of interest. he thrives in us unplugging, doing the do’s with little or no heart. But once again, thank God for his faithfulness and his continuing to remind us of who he is when we get distracted. No matter where you are in your walk, only God knows the day the journey ends for us on this earth. I pray we will not be taken up by the winds of life or lose interest in the stillness. I pray that God continues to draw us in, continues to remind us of who and why we are. In a world where everything is pulling us at every side – of which the end points are empty and dead – we desperately need Him.